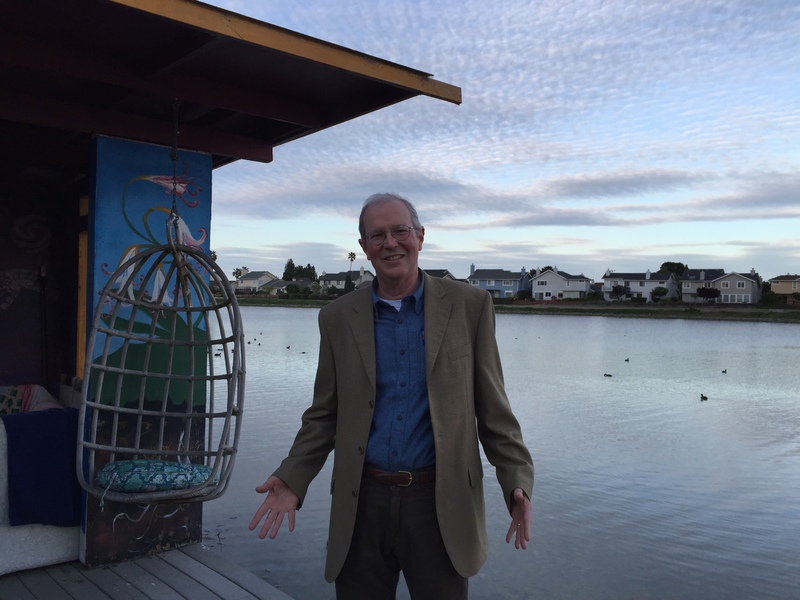 John Keener enjoyed a tour of the San Mateo Ecovillage and shared that it was an unusually relaxing experience for him. He certainly seemed to enjoy the tour. 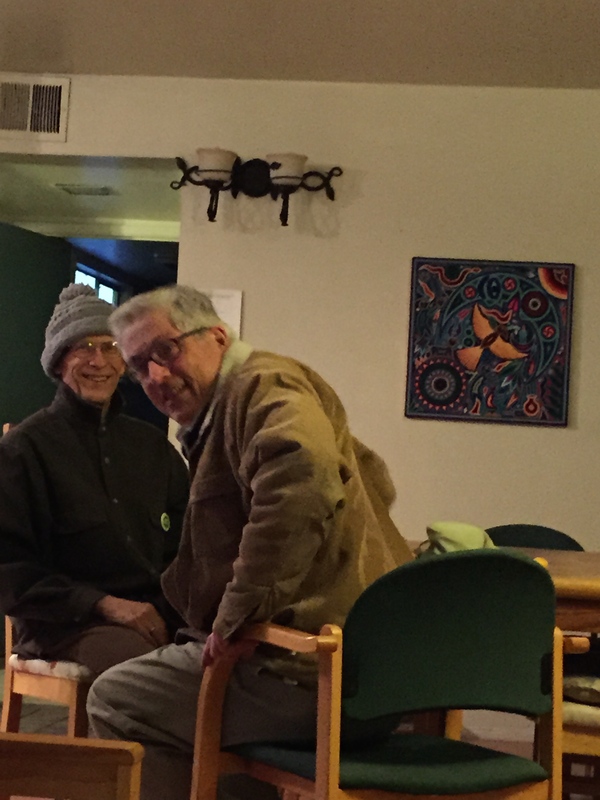 A group of interested San Mateo County Greens enjoyed John Keener’s excellent presentation about his experiences as a candidate running for Pacifica City Council followed by some of what has been happening for him since he was elected to that council. He is going to get us a hard copy of his speech so we can share it with other candidates locally and nationally. We also talked about experiences of other candidates and the possibilities for running more Greens locally. The conversation continued with the possibility of having a meeting on the coast in the future. Near the conclusion of the meeting, there was a brief conversation about the next GPCA General Assembly in San Jose in June which will be held in conjunction with the US Social Forum. Both are still in the planning stages so their websites will be updated in the future. The Green Party of California will be presenting additional workshops and panel presentations at the forum on the two days proceeding the General Assembly. 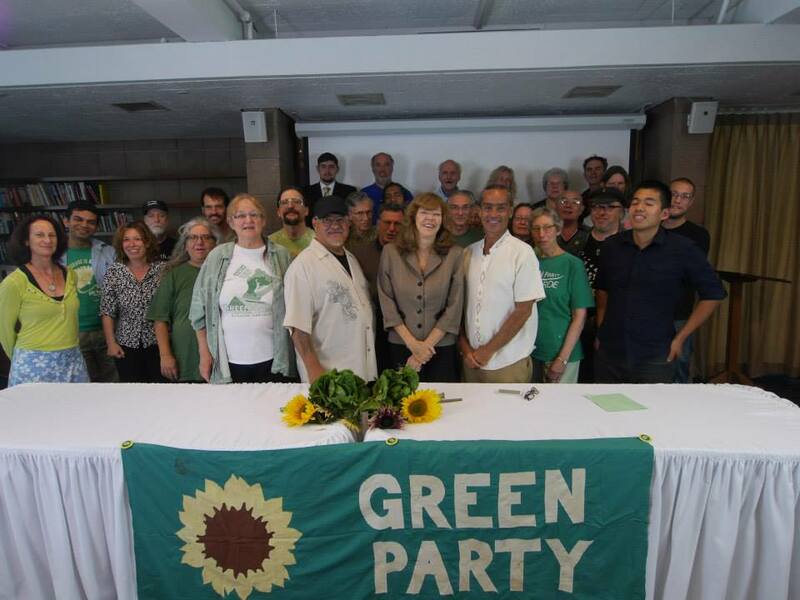 The Green Party of San Mateo voted to co-sponsor those workshops. If you are curious, at San Mateo Ecovillage, you will be able to not only see organic gardens and fruit trees, but also chickens, bees, and three kinds of fish in an aquaponics system. Onsite parking is for tenants only and parking on the street is somewhat limited….certainly not like San Francisco, so if you can carpool, that would be great. Note: next month, on the 4th Tuesday, we hope to move our meet, greet, and discuss to somewhere on the San Mateo coast between Half Moon Bay and Pacifica. We are still looking for a venue. We took a break from county party activities during the winter quarter of the year. That doesn’t mean that the Green Party and activism was out of our lives. During that time, we participated in many other activities including the GPCA State Meeting in January in Monterey County. Also Sanda Everette traveled to Lima, Peru at the time of the UN Climate Meeting and participated in the People’s Climate Summit and the Federation of the Green Parties of the Americas meeting. In January, several of us went to Oakland for the Climate march to stop fracking meeting with other Greens from the east bay. Registration is optional, but would help us plan. Please register so we know how much popcorn to bring! Driven to make the world better for his newborn daughter, John Ennis looks for ways out of our system of pay-to-play politics. Along the way, he journeys through high drama on the Ohio campaign trail, uncovers the secret history of the game Monopoly, and explores the underworld of L.A. street art on a humorous odyssey that reveals how much of a difference one person can make. PAY 2 PLAY: Democracy’s High Stakes is a fun guidebook to returning the United States government to its People. As we said in the June post, our first meeting of the fall will be on September 23 at 6:00at San Mateo Ecovillage, 3329 Los Prados St. #2, San Mateo.…near Hillsdale and Norfolk. Rather than our usual format of an administrative meeting and then a “Green Talk” we will first enjoy the garden and socializing with each other, eating some snacks, and then brainstorm about growing our party as well as learning about what is happening with Greens around the state, around the country, and around the world. Sanda Everette will have just returned from NYC where she was part of the support team for the Climate Convergence Conference, particularly assisting with video and Livestreaming and join them in marching in the People’s Climate Rally. Other San Mateo Greens will be attending the People’s Climate Rally in Oakland. I am sure folks will have lots to share. San Mateo Green Party County Council Member Sanda Everette just returned from the Green Party of the United States Annual National Meeting. During the first evening of the meeting, there was a 30th anniversary celebration with some great talks by early Greens, including GPCA Coordinating Committee member, Mike Feinstein. Portions of the ANM were Livestreamed on the GPUS channel by Sanda and others. including that 30th anniversary celebration. More about our history and what is happening currently can be found in the current issue of Green Pages. There is a downloadable pdf version of the paper as well as directions to order bundles of papers. Note….in case you didn’t notice it last month, there will not be a GPSMC public meeting until September on our usual 4th Tuesday. Keep an eye on this webpage to see whether the meeting will be at the bookstore or the ecovillage. 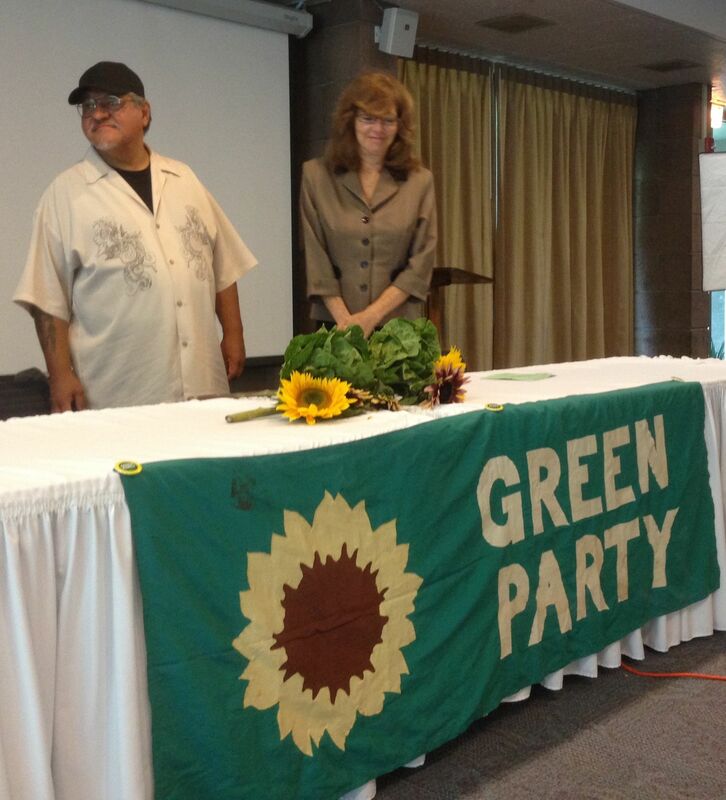 Mark Roest and Sanda Everette were delegates from the Green Party of San Mateo at the GPCA Meeting in Santa Barbara this past weekend. They reported that it was a very interesting and effective meeting. Things went very smoothly and despite a need for several agenda changes, it passed quickly. After a detailed overview by Tim Laidman, the budget was passed by consensus. We had great talks from Ellen Brown and Luis Rodriguez who share extensively about their campaigns and discussed how they worked with the state party. David Curtis had a family emergency and was not able to join us in Santa Barbara, but called in by Skype and gave a very interesting campaign summary and suggestions for improving Green campaigns. It is very strange that we will not have any statewide candidates on the November ballots but we anticipate several good local races. After they are officially candidates, those races will be posted on a state web page. On Saturday night we pulled all the couches and chairs into a circle and had a great session with Ellen and Luis and all the delegates sharing about campaigning and about growing the party. Almost every delegate was staying at the dorms at the university and it definitely added to the feeling of being together. People really enjoyed the venue at UCSB. It was quite beautiful and many enjoyed walks or bike rides before or after the meetings by the lagoon or the ocean. On Sunday, the platform planks were defeated because there was a general sense of the body that we should not put bandaids on the platform, but rather take on a total revision and update. We want to focus on basic themes and keep detailed time sensitive issues for media release and campaigns. People were encouraged to join state committees and there were several new committee chairs approved. The Coordinating Committee announced to the body that they were seeking counties to host the winter meeting and the budget meeting for next spring. The CC has had responsibility for the last several meetings and said that they were not willing to do it again without a host committee. Delegates from both Monterey and San Francisco said they would bring the request back to their counties. The County Council continued with a discussion of the upcoming SGA votes. Then in a consensus decision, the County Council decided it would be good to take a break from “Green Talks” during the summer. We will be meeting informally and exploring additional ways to publicize our events and to reach local Greens. We are planning a special event right after the fall equinox, on the fourth Tuesday in September, the 24th. Check back for further details. If you have any questions about the party during the summer, feel free to contact members of the County Council. If you are one of those rare individuals who actually enjoy administrative meetings, consider joining us on the County Council. The only real requirement is to be a registered Green in our county.